For most us, the arrival of the easygoing days of summer means it’s time to lighten up on our makeup. Heavy eyeliner and mascara seem out of place on a beach or at the pool (or at a polo match, where you’ll find me). A great way to play up your eyes is with the subtle, yet powerful technique of lining your eyes right at the lash line to create an “invisible” eyeliner effect. Known in makeup artist parlance as “tightlining,” this method takes a bit of practice, but is well worth the effort to master as it is the key to the quintessentially popular “no makeup” look. Used on its own, tightlining creates the illusion of big, luminous eyes without obvious makeup. It can also be used to enhance a smoky eye. The secret is to place the liner precisely at the rim of your upper lash line, just where it meets the water line (the thin wet area of skin just below the lash line). Start by selecting the right tools: a flat eyeliner brush and either cake or cream eyeliner. 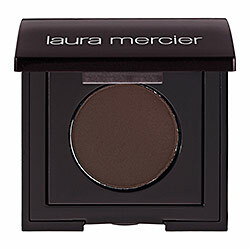 Many makeup artists swear by Laura Mercier Tightline Cake Eye Liner. Since you’re placing the product so close to your eye, a non-irritating, all-natural liner that stays put is a good idea. My favorite: Silk Naturals Cream Eyeliner. It’s waterproof and free of silicons, petroleum products or parabens that can bother sensitive eyes. To line the upper lid, very gently pull your eyelid up to expose the lash line. Apply liner, focusing on the gaps between lashes, directly to the underside of lash line. Be careful to avoid placing pigment on the actual water line, as this can get makeup into your eyes, causing it to smear. Furthermore, it’s unhygienic, so I really don’t recommend it, especially for contact lens wearers. Finish by tracing your lower lash line in a similar fashion — by keeping the line tight to the spaces between lashes. For the most natural look, use an espresso brown or soft gray liner. Remember, do your tightlining before applying the rest of your eye makeup to prevent smudging. I usually complete my makeup with a swipe of conditioning mascara and a dab of tinted lip balm for an effortlessly natural look that lasts through at least eight chukkas. A native Washingtonian, Beauty Blogger Lia Phipps is an interior designer with an irrepressible, life-long fascination with health and beauty. When she is not selecting fabrics and paint colors for clients, she occupies herself with trying new products and dispensing beauty advice to friends, acquaintances and anyone who is willing to listen to “Tips from Phipps”.